Virginie Ward, Chanel’s creative studio director, stepped out in his place. 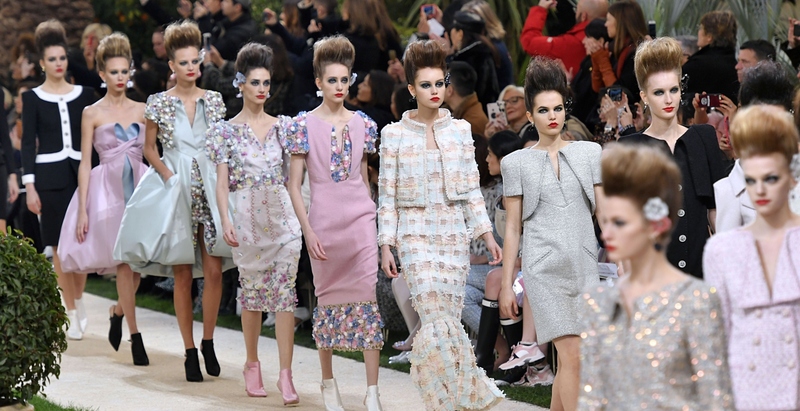 Karl Lagerfeld did not take the final bow at the Chanel Haute Couture Spring 2019 shows in Paris today, WWD reports. Instead, his right-hand, Virginie Viard, stepped out at the end of the show to greet the audience. For her bow, Viard was accompanied by model Vittoria Ceretti dressed in the final look—an embellished cut-out bathing suit and a matching swim cap with a cascading veil. “Virginie Viard as creative studio director and Eric Pfrunder as Chanel’s director of image continue to work with him and follow through with the brand’s collections and image campaigns,” the French fashion house added in the statement. After the first showing at 10 a.m. local time, an announcer said Lagerfeld would appear for the second presentation at noon. After he missed the second show, the announcer said, “We wish Mr. Lagerfeld to recover quickly,” without providing further details, WWD reports. She and Lagerfeld have a close friendship, Viard added to the British outlet. They “speak all the time” and “see each other every other day;” he even sends her sketches via phone. The Grand Palais was transformed once again into a fantastical setting for Chanel’s latest couture offering. This time, the iconic French venue was reimagined as a Mediterranean villa, AKA Villa Chanel, complete with palm trees, and outdoor garden setting, and a pool. This micellar water leaves you no choice but to head to bed with a clean face. Let these Instagram accounts inspire you.